Sheffield United claimed a huge victory in their quest for promotion to the Premier League, with a 0-1 win against West Bromwich Albion at The Hawthorns in the Sky Bet Championship. The two sides occupied third and fourth place respectively heading into the mouth-watering clash following earlier results in the day, and knew that a win would keep them right in the running for a spot in the top two. A Kieran Dowell header in the 14th minute was enough to separate the two promotion-chasing sides, and move United back up into second and into the automatic promotion places, above fellow Yorkshiremen Leeds United. Meanwhile for West Brom, they failed to move above their opponents, and instead remain in fourth place, four points off the automatic positions. In a vital match at the top of the table, neither side started at their best, with balls frequently given away in midfield by both teams - and it was one sloppy occasion that saw the visitors get their noses in front. An under-hit Mason Holgate pass on the edge of United's box left Gareth Barry short, and allowed their opponents to break. Kieron Freeman powered down the right-hand side, and in turn played in the overlapping Martin Cranie, however his pass looked to be heading out the play. Central defender Cranie did superbly well to not just retrieve the ball but put in a cross as well, and his delivery fell right onto the head of Dowell, who looped in over Sam Johnstone to put his side in the lead. The on-loan Everton attacker's first goal of the campaign sparked the match into life, with both teams appearing much less viscous from there on forward. The home side almost responded instantly, however Jay Rodriguez could not his head get over a vicious cross by Holgate from eight yards out. Johnstone then produced a superb save low to his left to prevent Marvin Johnson from doubling the score after a penetrative run and backheel from goalscorer Dowell, the stopper tipping behind the wing-back's low, curled right-footed effort from 25-yards out. 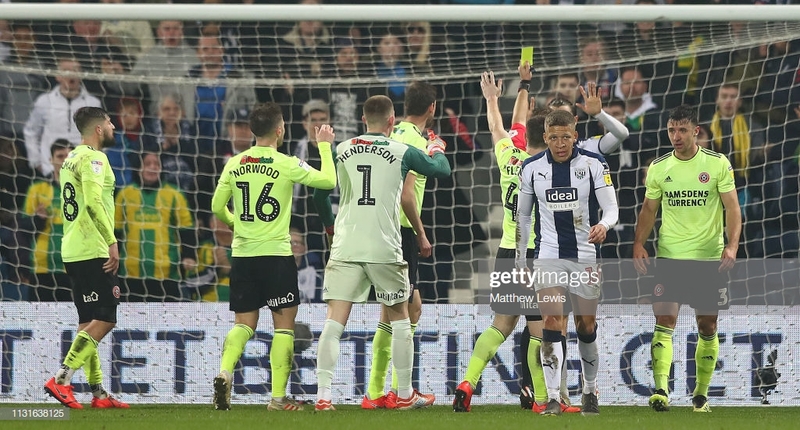 Neat footwork from David McGoldrick on the byline presented an opening for the frontman, however he could not beat Johnstone nor find a team mate, whilst West Brom were unable to seriously test Dean Henderson despite a number of well-worked opportunities. The home side prodded and probed for an equaliser, throwing crosses into the box and looking for the dynamic movement of their forward-most players. United continued to defend resolutely however, repelling wave after wave of attack whilst also remaining a great threat on the break. The home crowd began to grow restless, particularly when they felt that the ball was not being moved forward quick enough from the back. They thought they had levelled in the 83rd minute, however Rodriguez's attempt on goal was swiftly ruled out - and the attacker was duly booked - owing to deliberate handball following a fizzing right-wing cross. Their last throw of the die came when a long ball ran through to substitute Jefferson Montero, however Henderson was rapidly out to smother his effort, and secure his side the points in the process. Chris Wilder's outfit have become renowned for their unique style of incorporating rampaging wide central defenders into their offensive armoury, and it was this tactic that yielded their opener tonight. It offers so many numbers and options, and provides a real headache for opposing defences. All teams will now be aware of this; few can actually prevent it. Wideman Phillips returned to the line-up following a prolonged spell on the sidelines due to injury, and he was a menace for all of his 63 minutes on the pitch. Offering genuine pace and power with the ball, he looked the most likely of those in navy and white to produce that moment of quality. If he can stay fit for the rest of the season, then Albion will have an embarrassment of riches at the top end of the pitch. Much, if not all, of the creativity and flair for Darren Moore's men this year has come from their dangerous attacking pairing of Rodriguez and Dwight Gayle. They have contributed 33 goals and 7 assists between them, and will likely be the reason that the Baggies will be fighting for automatic promotion right until the end of the season. Yet United did not allow them a sniff for the most part, with their backline marshalling the duo superbly well. Furthermore, they also ruffled the usually reliable Barry into uncharacteristic errors in possession, thus disrupting the flow of West Brom as a whole. Aside from the obvious goal, attacking midfielder Dowell was a constant threat for United. Drifting into clever pockets of space, he was always looking to receive the ball, turn and drive at the West Brom defence. Having replaced the usually excellent Mark Duffy in the hole between midfield and attack, the pressure was on the England under-21 international to deliver - and he certainly did just that.